Disney's Animal Kingdom opened on April 22, 1998 (Earth Day) and today is the fourth most-visited theme park in America, drawing more than 10 million visitors a year. Animal Kingdom is best known for its live animal exhibits (hence the name) and its Expedition Everest roller coaster. For us, a family of five (plus our niece), we saw it as little more than a glorified zoo. Of course, Disney's Animal Kingdom is filled with the marvels of Disney imagineering and the overall "Disney Magic" philosophy, but it doesn't quite feel like a Disney park. It was a decent place to visit for half a day and there are some cool rides. We especially liked the Yeti and the Dinosaur ride. 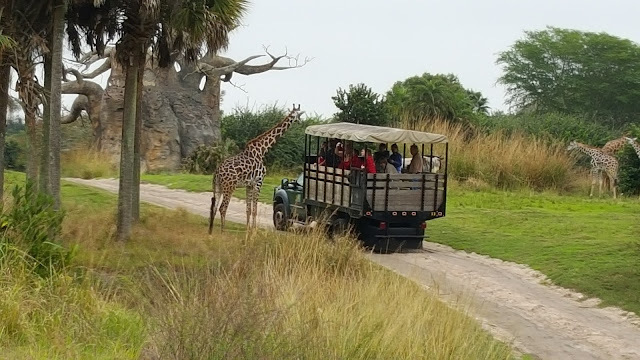 We also really enjoyed the Safari ride, and it was nice to be able to get a close up view of the animals, but overall, The Safari was rushed and it stopped for only a few seconds when driving by some of the animals.